It is a bad idea to let ideas enter an unthinking mind. Notice that the airflow is horizontal before and after the wing - something that just isn't true. The book said that it was due to the Bernoulli principal that wings created lift. This seemed fascinating and mysterious, and I kept wondering about how this worked. 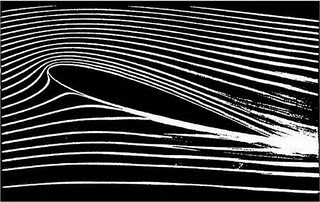 We were on a road-trip with in our 1962 Oldsmobile with the windows rolled down - I put my hand out the window and carefully made the top of my hand into the shape of the airfoil aligned parallel to the air, but I could feel no lift. If I tilted my hand I could get lift, but I could also do that with my hand flat. I became puzzled. Later, I saw some guys flying wire controlled hobby airplanes. There was one that caught my eye: it had nothing, but flat plywood for a wing - yet it flew - I saw it fly. I saw other normal air foils fly upside down! I asked why it could fly without a wing foil shape - I was told with a bit of hand waving it would work, but not as well as a real air foil. These explanations left me puzzled and unsatisfied. I had a "Power mechanics" shop class in eight grade and sure enough, there Bernoulli was again used to explain the low pressure that sucked the gas in. I asked lots of questions until I annoyed my teacher, I still wasn't settled on what let airplanes fly. I figured I just wasn't smart enough to understand what was going on. Years later, I had more math, Calculus and some calculus based physics - once again Bernoulli was in the book with a wing providing lift by the rapid speed of the air on the top of the wing - air continued to flow horizontally aft of the wing. This was at a university, I still stared at that picture and felt unsettled, something was wrong. Years later, my best friend had gotten a pilots license and we flew all over the place and I borrowed on of his books called Stick and Rudder considered a classic. The author wasn't a scientist, but his explanation seemed correct - that the wing deflected the air downward causing the opposite force up on the plane. Now I was bitten. He had to be right, otherwise planes couldn't fly upside down. But I had seen nothing to show that Bernoulli was wrong! The fact is that wings do produce lift by deflecting air down - imparting momentum on the air is how wings work. There is nothing wrong with Bernoulli's work - he just shouldn't have been invited to the party. The air is deflected downwards - by both the top and bottom of the wing - there has to be an angle of attack - a wing bottom parallel to the air flow provides no lift to speak of. The low pressure on top of the wing is more about accelerating the air downwards - the air foil curve helps this acceleration happen slowly so that no points become a vacuum and cause boundary layer flow separation so that the stall speed of the wing is reduced. If air flow over the hump is what provides lift - consider what would happen if after the hump if we extend a thin wing - that straightens the air out horizontally - the air would no longer be deflected downwards and there would no longer be any lift. Bernoulli's equations are consistent with what is happening - but does not explain what is providing the lift. (we might want to invite Bernoulli to explain stall speed) The low pressure helps accelerate the air downward - it is a consequence of imparting momentum to the air - not the cause. 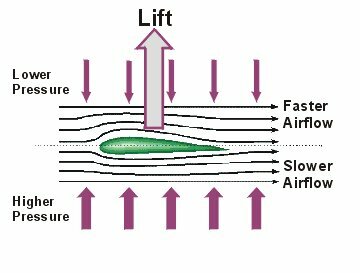 To say that the Bernoulli's effect (an increase in the speed of the fluid occurs simultaneously with a decrease in pressure) explains how wings provide lift ignores the bottom of the wing, flat wings and confuses rather than illuminates. If the air separates from the top of the wing - the air is no longer being deflected downwards enough to provide lift. The air at the bottom of the wing will continue to be deflected down, but then the air will accelerate up to fill the vacuum - in extreme cases flowing a short distance backwards over the top of the wing. The origin of the misinformation? I can only speculate - I suppose it was from someone that only partly understood. Then a great many did parrot and preach what they also did not fully understand. A Google search about air foil images will show many illustrations that are wrong - they simply do not reflect the reality that the air is deflected downwards (the vortex coming off the back of the wing helps keep things confused). The originator of this mess probably wanted to show off that he knew of Bernoulli and based on his position as an authority it was swallowed without question. If it doesn't seem correct - it might not be. Don't ever parrot and preach - be sure you really know. Doubt illustrations - they are often simplified and often don't match reality. This stuff happens often - Richard Feynman found examples in Physics books. (One example was a bar rolling down an inclined plane - the math worked just right - as long as you didn't calculate the rotational inertia. The author never actually did the experiment!) Don't trust your books - question authority - prove things to yourself - test reality - don't rely on computer models. Ockham of Ockhams Razor would tell us "'What can be done with fewer assumptions is done in vain with more'" . One could rightly say that using Bernoulli helps us calculate just how much lift a wing produces and how the lift is distributed about the wing, but wing lift is it is measured in the wind tunnel and calculated with rules of thumbs. 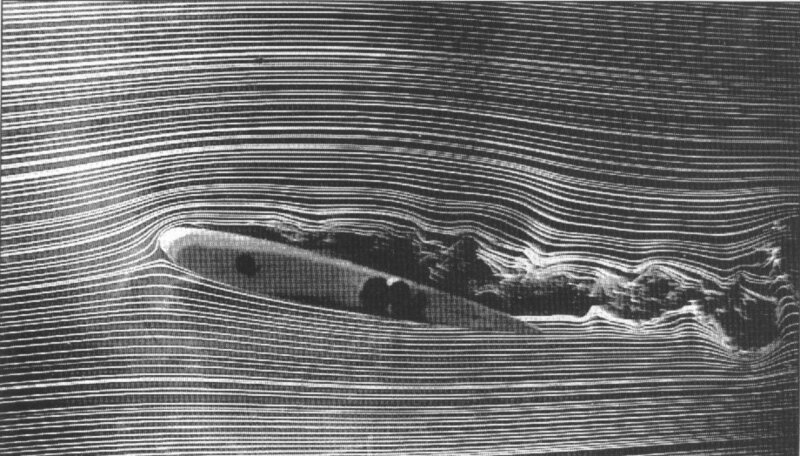 A lot of the details of what happens on a wing surface is due to turbulence - often leading to chaos- which leads to the failure of computer models. I guess the most important point is not that I was smart enough to smell the fallacy, but that this fallacy has lived for decades - continues to live - is regurgitated by smart people. It isn't enough to be smart - one has to be disciplined in thought. There are lots of people that can parrot information, there are less that actually integrate the knowledge and can see where it separates from reality. Then there are the very few (I've been lucky to know a couple ) that can see further. One can train oneself physically to run a bit faster, but what makes humans really amazing, is we can train our brains to think magnitudes further than what is average. Objective thought takes practice, discipline. We can read down the list of cognitive biases and spot the ones we have fallen for, but it takes constant vigilance to reduce ones susceptibility for falling for these evasions of reality. ( I suggest The Art of Reasoning (Third Edition) By David Kelly as one place to start. Or play music with a metronome - an electronic metronome never compliments you to be nice or disses you to put you down. Or listen/watch recordings of yourself (no one likes what they first see)).